The Southwater Event Group comprises of standout venues, an on-site production company, and hotels. Family owned, and with an unrivalled attention to detail, our focus is firmly on our clients and achieving exceptional service for every event. With our unique combination of a stunning venue, all services in-house and incredibly easy transport and site access, you really will find everything you need to deliver amazing events. 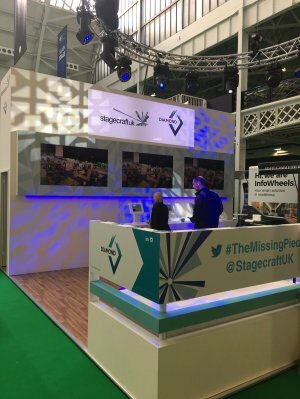 This year Stagecraftuk teamed up with Production Support Services and Diamond Exhibitions to create the ultimate stand experience. We were able to showcase our brand new OV30 5m truss circle, black and white dance floor, staging and AV equipment.Whilst Diamond Exhibitions were able to show what they can do with a free build stand. Leading up to the event we were running a 30-day #TheMissingPiece Twitter campaign, to give our audience an insight into what we can do for them, as well as getting them excited for our timed challenge. Exhibitors had the chance to win a Red Letter Day by completing the Snafooz puzzle box challenge! The two winners were Kate Hannam on day one, completing the puzzle in a speedy 54 seconds, and Iyesha Cheema-Bradshaw on day two in staggering 46 seconds! We are excited to announce that we have already had some great leads from top companies since the show and are looking forward to following them up! for your company, give us a call and we will be more than happy to chat and explain what we can do for you! Providing live event production services to the whole of the UK, including Manchester, Leeds, Liverpool, London, Scotland, Cheshire, Birmingham, the West Midlands, Wales, Chester and Yorkshire. Planning an event? We'd love to hear from you! Our specialists are available to discuss your event today!